There are some very good freight broker software packages in the marketplace. And many individuals think that getting freight broker software is a necessity when getting started. I get these types of calls quite often. Here is what I tell them: The best freight broker software in the world won't help you get customers. And, getting customers should be your number one priority. The software will help you manage your business once you get a substantial book of business - but it won't help you find customers. Plus, it's expensive. One other thing: if you need to record and analyze your load activity, freight broker software will probably have you download information to a spreadsheet. Guess what? That is why I have prepared my Load Manager spreadsheets. With these Load Manager spreadsheets, you can record loads, monitor your progress and analyze which shippers are giving the best profit margins, which are paying you quickly, how many loads are they giving you within various time frames and how easy is it to cover your loads that you get from particular shippers. In addition to monitoring your customers, you can even find which lanes are giving you the best bang for your buck, so to speak. These Load Manager spreadsheets are several of 33 handouts that are included in my freight broker training packages. And you won't find anything equal to them elsewhere. If you have not read my website in detail, go now to: http://www.atexfreightbrokertraining.com There is a lot of good info there. This is the final part on this topic of automating your freight broker business. So, let us repeat your benchmarks regardless of whether you are automating your freight brokerage or whether you are using spreadsheets. However, your first primary effort in starting your freight brokerage will be finding customers who are ready, willing and able to give you good paying loads. This is not an easy task despite its apparent simplicity. So, you need to have marketing strategies in place and you need to know some sales techniques. Let me say that one of the best sales techniques is to ask questions. Asking the right questions will establish you as a professional. We provide tools to do all this and more with our Load Manager spreadsheets. You do not need fancy or expensive software for these tasks. We also provide a business model for you to record activity so you can evaluate particular “lanes” so you know how to build your own “hot spots”. Another additional function in your record keeping is to build a database of customers and carriers. Good freight broker software WILL help in this regard. This software will also help build a history of load activity. Instead of expensive software, however, we recommend using a simple but powerful and inexpensive database package to access customers and carriers and all their particular information. So, you can do things the expensive way (and still may not be able to get the analyses your need). Or you can work with our spreadsheets and put to use some powerful tools to help you make good business decisions as your strive to rake in some money. In Parts I, II and III, I am basically making a statement that expensive freight broker software may not be that necessary starting out. After all, fast and efficient software has helped many business owners do dumb things very quickly. No matter how fast or efficient the software is, it still boils down to knowing what information to collect and then monitoring and evaluating the information in order to make good decisions which will lead to making money, money, money. Another of several items you need to record and monitor is how fast the shipper is paying you. It does no good to get a lot of loads if your shipper is sitting on your money. The longer you have money in the form of a receivable, the more chance you have of NOT collecting it. Why work for nothing? You want to get paid in 30 days on average. Yet, there probably are some brokers who are due money for 4, 5 or 6 months or longer. That’s a shame. It is THEIR fault, not the customers. I do recommend getting some financial software to expedite your invoicing. IF you are somewhat proficient with using software, consider using QuickBooks which is the most popular and user-friendly accounting software. With QuickBooks, you can easily generate invoices and statements as well as monitor your accounts receivable. Don’t confuse yourself with financial software like QuickBooks versus freight broker software. They are different. QuickBooks is used for preparing monthly and year-end financial statements while freight broker software is for managing your loads. Some freight broker software will let you download information to QuickBooks to allow you to do your financial statements. QuickBooks is also called “general ledger” software while freight broker software is also called “dispatch” software. Regardless of what method you use to record and monitor your loads and prepare your financial statements, you need to do day-to-day cash management. We cover cash management in greater detail in our training. In Part V, we will mention these four benchmarks again to help this information sink in a little better. They are that important. In Part I, I mentioned that your primary goal is to focus on gaining customers and expensive freight broker software will not help you here. In Part II, I mentioned that even if you have good freight broker software, you may still need to download some data into spreadsheets so you can properly monitor and analyze your activity in order to make good business decisions. Most freight broker software will calculate your gross profit margin on each load. However, it is doubtful that this software will give you your gross profit margin for the entire period for all your loads. This is one reason why you may need to download information to a spreadsheet. So, being able to calculate your gross profit margin on a cumulative basis is extremely important. It is one of your most important benchmarks. Next, you need to know which particular customers are giving you the highest gross profit margin. Generally, you will want to pursue those shippers who are giving you a good rate where you can offer a good, competitive rate to the carrier and still maintain a good margin of profit for yourself. There are exceptions to this, however. For example, if you are being offered loads with potentially high profit margins but the shipper is only giving your one or two loads per month, you may be better off taking a lower profit margin but getting 10, 15 or 20 loads per month. Further, you may have loads with a high profit potential but for some reason you cannot get a truck to cover the load. You don’t make any money if you can’t find a carrier who is willing to move the cargo. It could be that the carrier is not near the pick up point. Or, perhaps a carrier does not want to go to the destination you need it to go. So, high profit margins are the first thing to look at from a customer; but getting a good volume from the shipper and finding trucks for the loads also factor in as you are evaluating various customers. In Part IV, I will turn the attention to one of the last items you want to focus on as you build your customer base. And, I will summarize the important benchmarks you may want to put into a spreadsheet so you can make good business decisions and do so in rapid fashion. In Part I, I mentioned the fact that if you are starting a new brokerage, you need to focus on getting customers first. And, the best software in the world won’t help you do this. After getting established with consistent loads, you may want to start thinking about freight broker software. But it does not come cheap. Expect to pay at least $2,000 plus monthly or annual maintenance fees. Purchasing freight broker software may be a good move but only after your business has justified this expense and will prove to give you the efficiencies you desire and need. Other than processing load information faster and more accurately, there is not much that expensive freight broker software will give you that you cannot do manually. Keep this in mind as you contemplate purchasing freight broker software. Here is something else to consider: when starting your freight brokerage, you need tools to help you record, monitor and analyze your activity. Some freight broker software will help you collect important data on your activity; but you may STILL need to download the data to a spreadsheet in order to monitor, analyze and make decisions. In Part III, we will look at some specifics that you need to focus on as you start building a customer base and recording your activity. Two big questions that pop up regularly are, "What type of software do I need and is it expensive?" There is a quick answer for these questions. 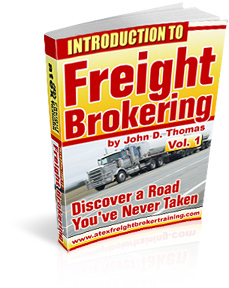 If you are starting from scratch, you don't need ANY special freight broker software. Here is why: when first starting your business, you main goal is to find customers. The best software in the world won't help you here. To find customers, you do it the old-fashioned way - your earn them one at a time, as the saying goes. Now AFTER you have established yourself with several solid customers and are getting good loads consistently, you may start to look for freight broker software. You can derive some efficiencies if you have a lot of transactions going on. You will know what to look for by doing business manually at first. It does not matter how many bells or whistles freight broker software has, you want to stay focused on finding customers at first.